[BB-Blog]: Oscar Diaz "Ink Calendar." A beautiful prototype. I would love one of these. 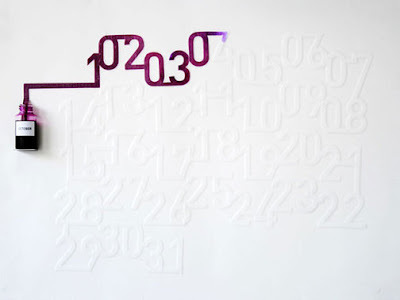 "Ink Calendar" make use the timed pace of the ink spreading on the paper to indicate time. The ink colors are based on a spectrum, which relate to a “color temperature scale”, each month having a color related to our perception of the whether on that month. The colors range from dark blue in December to, three shades of green in spring or oranges, red in the summer. The scale for measuring the “color temperature” that I have used is a standard called ‘D65’ and corresponds roughly to a midday sun in Western / Northern Europe. The "Ink Calendar" was developed for “Gradual “, an exhibition featuring works, which were evolving during the exhibition time at the London Design Festival 2007. Specs: Ink on paper, various dimensions. Exhibitions: "Gradual" 5, Crownwell Place, London Design Festival, 2007. Cool blog you got here. It would be great to read something more concerning that topic. Thank you for posting this info.